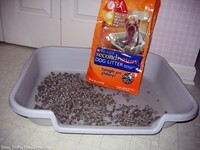 Trying to get your dog to stop peeing in your house? You definitely will need to get your dog on some sort of a schedule to stop them from peeing and for housebreaking to work. Here you'll find great ways to get your dog to adapt to a daily routine and helpful tips for housebreaking and crate training. You want to get your dog on some sort of a schedule so he always knows when he’s going to be allowed outside to pee & poop, when he’s going to be fed, and when he’s expected to go to sleep for the night. Setting these types of boundaries and expectations for your dog will make potty training — and other things — so much easier. 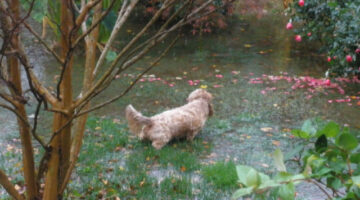 Here’s how to get your dog to adapt to a daily routine. To aid us in potty training our dog, we decided to try a dog doorbell. Take it from me, by teaching your dog to ring a bell to let you know when she has to go outside, you will definitely have fewer accidents in the house! 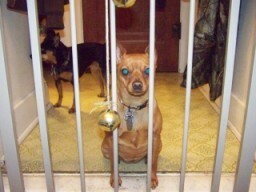 Here’s how we used dog bell training with our 2 dogs. 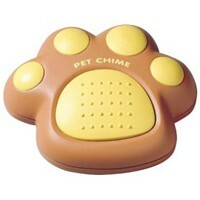 This remote control paw activates the Pet Chime wireless doorbell for dogs. Dogs can be taught to press the paw-shaped transmitter to signal whenever they want to go outside or come inside. Simply place a Paw near the door — indoors or outdoors — or on the floor. When mounted at dog’s-eye-level, your dog can press the Paw with its nose or its paw to activate the Pet Chime doorbell.